The AMP ENERGY National Gaming Tour that has been visiting Canadian college campuses since late February is set to rock the Yonge-Dundas Square in downtown Toronto on June 20, 2009. Four Canadian virtual rock bands will live out their rock and roll dreams when they compete in the AMP ENERGY $100,000 Rock Off. The competition, which will award a $100,000 grand prize to the best band, will take place at Yonge-Dundas Square on the main stage of the North by Northeast (NXNE) Music Festival. The four competing bands are the finalists from the AMP Your Game National Gaming Tour. The tour traveled to 39 college and university campuses across Canada from February to April auditioning talented gamers in a national Rock Band 2 contest. At each campus, a winning band was declared and moved onto the semi-finals on the AMP ENERGY Canada Facebook page. The four bands will showcase their skills on stage in the evening in between NXNE performances in front of three judges, the live audience and a Facebook audience. Video of the performances will be streamed live on the AMP ENERGY Canada Facebook page and viewers will vote for their favourite band. The judging panel, still to be announced, will include two well-known musicians as well as our good friend and professional gamer Nelson Triana, captain of the AMP ENERGY Pro Team, North of 49. The judges will choose their favourite band based on a combination of best performance (70%) and game score (30%). Performance (70%) is made up of both judging criteria and Facebook votes. The band with the best score out of 100 will be awarded the $100,000 grand prize. 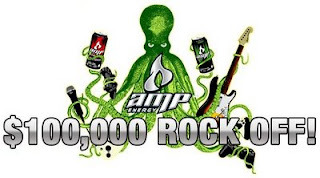 In addition to the AMP ENERGY $100,000 Rock Off! at the North by Northeast festival, AMP Your Game will also set up a free gaming venue and lounge to enjoy the music festival at Yonge-Dundas Square from Thursday, June 18 to Sunday, June 21. The AMP ENERGY Lounge will feature 10 gaming stations, a seating area and product displays. NextGen Player will be on-hand at the event, so expect plenty of coverage, photos and fun!